Their first stop was Camp Buluh, where orphaned orangutans Okto and Shifa were out playing in the trees. Camp Buluh staff said that they were both healthy and active and because they had been given their multi-vitamin and anti-worming injections the week before, they were left to carry on playing. Okto having his regular boost of essential minerals and vitamins. Second stop, Camp JL - young orphaned orangutans 5 year old Nyunyu (left) and 3.5 year old Mona (right) playing in the trees. The next stop was Camp JL to check on Adib and see how his arm was healing and to see Mona, Nyunyu, Timtom and Boy. 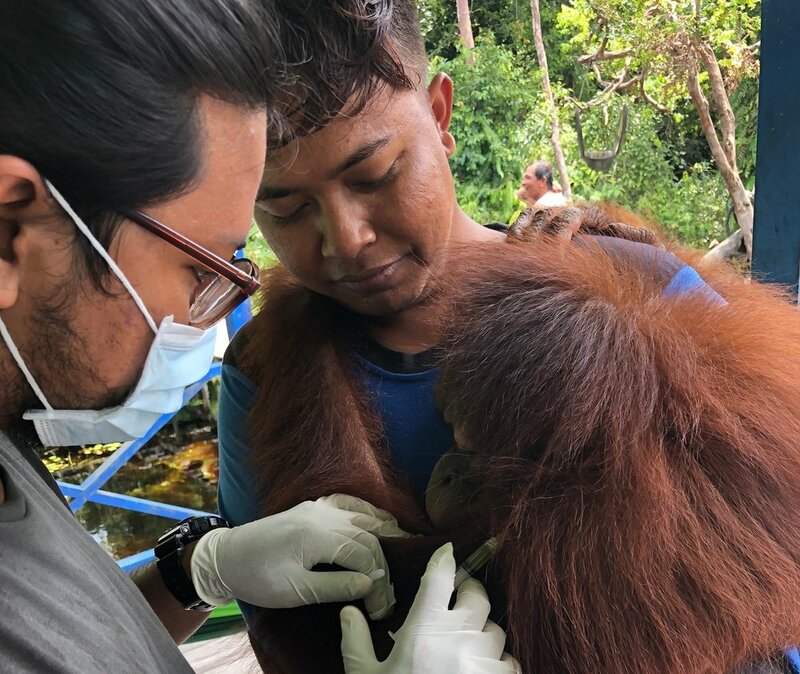 Camp JL- 3.5 year-old female orangutan Timtom, January 2019. The only access to the release camps is by river and so Dr Dimas and Pak Azhari headed off to their final camp of the day, Camp Gemini . Half way through their journey they came across a longboat with an unexpected passenger! Female orangutan, Sheila in Camp Gemini’s longboat. Adult female orangutan Sheila and her infant Sony, had untied and taken the longboat, belonging to Camp Gemini, and were using it to cross the river. Sheila was in no hurry to leave the boat but eventually they climbed out onto the river bank and up into a tree. Azhari and Dimas managed to tow the longboat back to Camp Gemini, where the relieved team of Camp Gemini staff were waiting. They’re devising another way to prevent these highly intelligent great apes from taking a boat again!